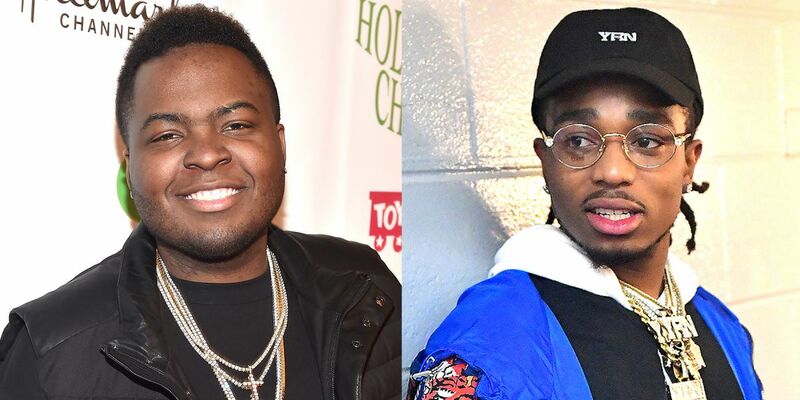 As reported earlier today (Feb. 22), Sean Kingston and Migos allegedly got into a nasty altercation while in Las Vegas, one that reportedly left the Jamaican singer-songwriter in rough shape. However, now that some time has passed, Kingston has come forward to address the situation, hinting vaguely that the reports of the incident are not true. Once the chaos calmed down, the singer recorded a selfie video of himself, showing off his seemingly unscathed face and claiming that he remains unbothered by the situtation, saying, "You can't keep a good man down." In the video, Kingston doesn't address the Culture rappers by name, but instead simply insists that his face looks "smooth as motherf**king ice" while posing the question, "Do I look like I got jumped?" However, the video doesn't appear to prove that the fight didn't happen in any capacity, just that Kingston is in good spirits and doesn't have any visible bruising. Video footage was also released claiming to show Kingston being handcuffed after the alleged scuffle, which appears to be much more incriminating than Kingston's claim that the situation didn't escalate or go down whatsoever. Take a look at the receipts in the video clips below to see for yourself. In the glimmering city of Las Vegas, the possibilities for what can happen are extraordinarily endless. But what happens in Vegas doesn’t always stay in Vegas, and that is allegedly holding true for the trio of the Migos and Jamaican singer-songwriter Sean Kingston. According to TMZ, a nasty, physical altercation broke out between Kingston and the Culture rappers, leaving the Jamaican artist painfully battered and bruised. Law enforcement told the site that the brawl happened at the Sands Expo and Convention Center on Tuesday (Feb. 21). Initiated by an argument regarding Soulja Boy, who previously had it out with the group’s fore-running member Quavo, the trio allegedly stomped out Kingston with kicks to the head as well, TMZ reports. In a nearly fateful twist, a member from Kingston’s entourage drew a gun and fired off a single shot. Fortunately, no one was struck and the shooter was taken into custody by officers who responded to the uproar. TMZ adds that while the “Beautiful Girls” singer and Migos had all fled the scene before Las Vegas police arrived, Kingston was approached during a traffic stop. He was reportedly "semi-cooperative," but was tight-lipped on much of anything else involving the incident. Law enforcement is also allegedly interested in speaking with Quavo, Takeoff and Offset as well. Migos apparently aren’t looking to make any new amigos. The rowdy Georgia rap trio allegedly got into a brawl with Jamaican-American singer Sean Kingston while attending an event at the Sands Expo and Convention Center in Las Vegas on Tuesday afternoon, according to TMZ. The fight broke up after somebody in Kingston’s camp pulled out a gun and fired a single shot, not striking anyone. The “Bad & Boujee” rappers supposedly wrestled Kingston to the ground and began stomping his head around 4 p.m., police sources told TMZ. The fight had apparently erupted after an argument about fellow hip-hop artist Soulja Boy turned heated. Both parties were far gone by the time police arrived at the large convention center, according to sources. The Las Vegas Police Department identified the alleged shooter as Moises Johnson, 28, on Wednesday. He was booked at the Clark County Detention Center on charges of assault with a deadly weapon, carrying a concealed weapon without a permit and discharging a firearm where people may be endangered. The suspect fired "at least one shot" during the incident, police said, and no one was hurt. Kingston was pulled over for a traffic stop later in the evening and became “semi-cooperative” with police. The “Beautiful Girls” singer wouldn’t however rat anyone out, according to TMZ. He later denied getting jumped in a video posted to social media, according to TMZ, though the clip appears to have been taken down. Cops were still looking to speak with Migos early Wednesday, though there was no warrant out for their arrests. While there’s no publicly known bad blood between the performers, Kingston taunted Quavo — one of the three Migos — over social media last year, charging that he chickened out from a fight against Soulja Boy. A Florida man was facing felony charges Wednesday after police said a shot was fired during a fight between rapper Sean Kingston and hip-hop group Migos in Las Vegas. A shot was fired in the air but no one was reported injured in the fight Tuesday afternoon outside the Sands Expo & Convention Center, said Las Vegas police officer Danny Cordero. Moises Johnson, 28, of West Palm Beach, Florida was arrested and jailed pending a court appearance on charges of felony assault with a weapon, carrying a firearm without a permit and a misdemeanor count of discharging a gun where people may be endangered. He was being held at Clark County jail. Johnson was initially detained by event security guards and a .380-caliber handgun was seized from him before his arrest, the police spokesman said. Cordero said Johnson was part of a group with Kingston at the venue hosting an expo called Agenda. The expo was being held at the same time as the larger MAGIC Las Vegas fashion convention being held at other nearby event centers. The fight near an outdoor Sands Expo Center loading dock followed an argument inside that stemmed from a previous dispute between the two groups, Cordero said. The Jamaican-American rapper and Migos got into an argument over Soulja Boy, according to a report Tuesday by TMZ. Migos and Kingston had left the area by the time police arrived. The Beautiful Girls singer later took to social media and posted a video denying that he had been beaten. Kingston in the since deleted video insisted his face looks 'smooth as motherf***ing ice' contrary to reports that he was stomped in the head. The rapper, who also uses the name Kisean Anderson, was born in Miami and emerged as a musician in Jamaica. Migos consists of family members Quavo [born Quavious Keyate Marshal], Takeoff [real name Kirshnik Khari Ball], and Offset [born Kiari Kendrell Cephus] from the Atlanta area. The hip-hop trio whose debut album Yung Rich Nation was released in 2015 made their their first appearance Monday on The Ellen DeGeneres Show and performed their hit single Bad & Boujee on the chat show. Kingston scored his first hit in 2007 with the single Beautiful Girls that reached the top of the US Billboard Hot 100 chart. He also has collaborated previously with Justin Bieber and has been working on his fourth studio album. 0 Response to "Sean Kingston Denies Alleged Fight With Migos"